Monsanto and seed-corn companies continue to use contractors despite allegations of migrant labor abuses. 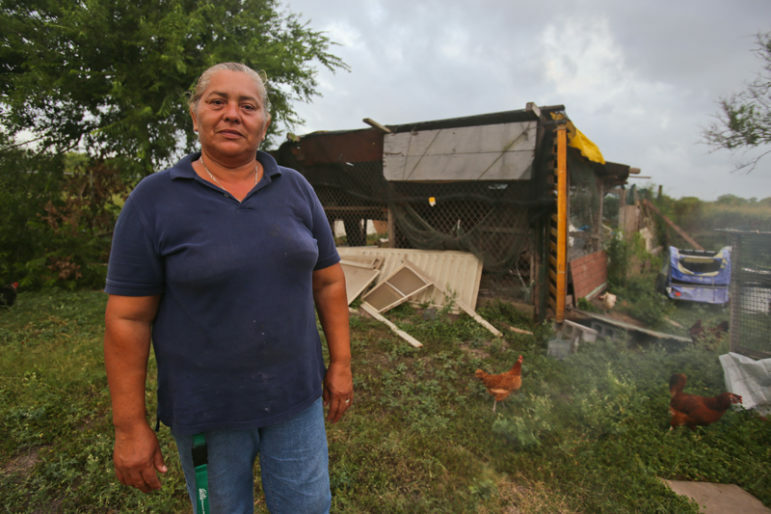 Nila Cantu, at her home in South Texas, was among the detasslers who complained about a Monsanto labor contractor who recruited the workers to a 2012 job in Iowa. With morning temperatures approaching 90 degrees one day in July 2015, a migrant laborer walking down rows of corn began to experience symptoms of heat exhaustion, including difficulty breathing and extreme nausea. The laborer was working near Boone, Iowa, for an independent contractor with the St. Louis-based Monsanto Co., which hires such contractors annually to recruit and oversee teams of migrant farmworkers in the cornfields of the Midwest. The farmworker was doing tasks related to detasseling – the practice of lopping off corn tassels, which enables growers to produce lucrative high-yield hybrid corn seed. Each year, seed-corn companies like Monsanto bring in thousands of laborers to produce the hybrid seeds, most of which are genetically modified. The companies sell the seeds to farmers worldwide, in what has become an $11-billion GMO corn industry. The farmers grow the seeds into corn for sale as food, ethanol, livestock feed and components of a range of industrial products, from fireworks to ceiling tiles. Companies like Monsanto bring in thousands of laborers to produce hybrid seeds every year. Monsanto and DuPont have faced repeated allegations of labor violations related to using of farm labor contractors. GMO corn is an $11 billion worldwide industry. In a two-year investigation of GMO seed-corn production, the Midwest Center for Investigative Reporting found repeated allegations of labor violations over the past decade against Monsanto, its counterpart DuPont Pioneer, other seed companies and the companies' contractors. A review of federal documents, lawsuits and Monsanto records – and interviews with advocates and experts – shows that the allegations include broken recruiting promises, minimum-wage violations, improperly withheld pay and substandard living conditions in seed-corn production of Monsanto and Pioneer. As a way to easily locate workers in emergencies, Monsanto requires its detasseling crews to stay within the rows they are assigned to work in. But that morning, the worker finished his water and needed more. Instead of walking the long way down his row of corn, he crossed over other rows of corn to get water more quickly. After learning about the shortcut, Monsanto's contractor, Eleuterio Cortes, allegedly fired the worker. The worker would not speak about his experience for this story and requested anonymity to protect his employment prospects. But an Iowa Legal Aid attorney, Jessica Taylor, complained to Monsanto on his behalf. According to a Sept. 22, 2015 letter Taylor sent the company, Cortes said he acted because the worker violated company safety policies and “couldn't handle the job.” The letter also alleged Cortes was not properly registered as a contractor with U.S. Department of Labor. But after Taylor sent additional registration information from the U.S. Department of Labor, Tonkin conceded that it was “more likely [the worker] was terminated than quit” — and wrote that Cortes, the contractor who allegedly fired the worker, had submitted misleading paperwork to the company. Monsanto's legal team had already handled a case involving Cortes' license two years earlier. According to a 2013 lawsuit filed against Monsanto by Texas RioGrande Legal Aid and settled out of court later that year, Cortes in 2010 recruited a crew of 22 migrant workers to the same Monsanto job in Boone, Iowa, then denied them promised housing and pay — and also was without a license at the time. A review of U.S. Department of Labor records revealed no evidence that Cortes was licensed at the time of that job or the 2015 job. To resolve the second complaint, in 2015, Monsanto paid the worker $1,250. By the next year, however, Cortes was back on a 2016 Monsanto list of active contractors, which legal aid workers gave the Midwest Center for Investigative Reporting. According to Taylor, Cortes did indeed work at the Monsanto site at Boone, Iowa, that year. Monsanto would not comment directly on Cortes or whether the company employed him in 2016, although it did respond to requests for comment for this story. Cortes could not be reached for comment despite repeated attempts. But it would not be the first time the company brought in a contractor who had previously been the subject of labor complaints in similar work. In the past decade, Monsanto approved the hiring of three contractors — Cortes, Hermilo Cantu, Jr., and Abel Cuello — after the contractors had previously triggered complaints related to their work in seed-corn production, according to a review of Department of Labor records and complaints to legal aid offices, including eight lawsuits naming the company over the decade. Monsanto is not the only target of labor allegations related to corn detasseling. A review of more than a decade of complaints to legal aid offices, including more than a dozen lawsuits, show labor-related allegations filed against DuPont Pioneer and other seed-corn companies, along with the companies' contractors. The Center's review looked closely at five detasseling-related complaints against Monsanto, including four lawsuits, in which the workers who complained were not prevented from discussing the cases and workers in some of the cases agreed to be interviewed. But according to legal aid lawyers, both Monsanto and Pioneer generally operate the same way in one important respect: They do not explicitly accept liability for all their contractors' actions. For one thing, Schell said, the two companies delegate to their contractors the responsibility for keeping track of hours for payment, typically an employer's responsibility. The ability to log the hours worked by farmworkers, he said, allows contractors the chance to underpay workers to keep money for themselves. In practice, according to Schell and other legal aid lawyers, the companies have not explicitly acknowledged a 2007 appeals court ruling holding seed-corn companies responsible for the actions of contractors who recruit and supervise workers. The seed-corn company targeted in the case, Reyes v. Remington Hybrid Seed Co., “must be deemed the workers' employer for events that occurred in the fields under its management or in its offices,” the court said. Monsanto and Pioneer, the two largest seed-corn companies, have settled numerous allegations like those at issue in Reyes. Both declined to comment on the Reyes ruling. In response to similar litigation, the companies generally deny wrongdoing or claim insufficient knowledge to respond to the allegations. The settlements normally explicitly stipulate no admission of wrongdoing on the part of the defendant. Monsanto and DuPont Pioneer declined to respond in detail to most questions about complaints related to their use of contractors. Monsanto spokeswoman Charla Lord would not comment directly on extensive written questions about allegations regarding the company's use of the contractors, despite repeated attempts since 2015. “That includes guaranteeing the safety of all the products we produce and ensuring the safety of all our workers around the world,” she wrote. She also pointed out that the company works closely with legal aid to settle any complaints quickly, a practice several legal aid lawyers confirmed. Spokesman Paul Bertels of the National Corn Growers Association, which represents 300,000 corn farmers and lists seed-corn producers like Monsanto and Pioneer as “industry partners,” also declined to comment directly on the use of contractors and complaints against them and the companies that employ them. “The NCGA does not have a position regarding FLCs,” Bertels wrote in an email, referring to the acronym for the Department of Labor's designation of Farm Labor Contractors. In recent decades, complaints have arisen as large agricultural businesses have increasingly hired contractors to serve as middlemen between agricultural companies and migrant workers. Legal aid lawyers and labor advocates say the current labor-contracting system too often results in abusive – and sometimes dangerous – conditions in the fields. While there are reports of worse conditions in other U.S. crops, labor allegations are better documented in genetically modified seed corn, according to legal aid attorneys and labor specialists. That documentation provides a window into the use of contractors and migrant farmworkers nationwide. Over the past decade, legal aid clinics that represent the low-wage workers in Illinois, Indiana, Iowa, Michigan and Texas estimate that they have fielded a combined total of about 50 labor complaints, including lawsuits, related to GMO seed-corn production. Legal aid lawyers and farmworker advocates said the numbers hardly reflect the scale of illegal treatment of migrant farmworkers or violations of federal law in the cornfields. “These complaints are the tip of the iceberg,” said Daniela Dwyer, an attorney with Texas RioGrande Legal Aid. For one thing, Dwyer and others said, legal aid clinics cannot file civil complaints on behalf of the majority of farmworkers nationwide. Since the mid-1990s legislation in Congress, which subsidizes legal aid, has effectively prevented legal aid organizations from representing some legal immigrants and all undocumented workers. But undocumented workers now represent more than half of farmworkers nationwide, according to Philip Martin, a University of California-Davis professor of agricultural economics and an expert in farm labor statistics. In addition, workers eligible for legal aid also remain reluctant to voice grievances, Dwyer said. Among other reasons, she said, they fear losing their wages, forfeiting scarce work the subsequent year, or being stranded with no funds to get home. “It's hard just getting clients to talk, for any reason,” Dwyer said. Miguel Keberlein Gutiérrez — a Chicago-based lawyer with the LAF legal aid clinic who has represented hundreds of farmworkers in cases against Monsanto, DuPont Pioneer and other companies — estimated that farmworker complaints to legal aid offices represent as little as 10 percent of the violations that take place in seed-corn production each year, an estimate echoed by legal aid counterparts in two other states. The Center's review of detasseling-related allegations made to legal aid offices has turned up numerous cases involving DuPont Pioneer, Monsanto and contractors for both companies — sometimes involving up to 30 or more members of a particular work crew. The cases, ranging from informal attorneys' letters to formal litigation, include more than a dozen suits filed over the past 10 years, almost invariably involving workers' claims of being misled at recruitment, not paid the days or hours they're promised, and housed in substandard facilities — in surroundings where they don't know anybody, don't speak the language and have little recourse but to accept the terms. At the root of the rising complaints, farm labor advocates and legal aid attorneys say, is an increasing use of contractors. From 2001 to 2015, the number of farm labor contractors and crew leaders nationwide increased nearly 20 percent to more than 173,000, with their wages rising 40 percent, according to the Quarterly Census of Employment and Wages. While statistics for the prior decade are more elusive, growers started relying more on contractors after Congress passed anti-immigration legislation in the late 1980s, which brought the threat of immigration crackdowns, according to the farm labor statistician Martin. In seed-corn production, Martin said, the change intensified an earlier trend: In the 1980s, high school students who had traditionally done detasseling throughout the Midwest (and still do in some counties) began finding more non-farm summer work. By the 1990s, the two trends converged, as seed-corn companies began hiring more contractors, or crew leaders, to recruit migrant farmworkers from South Texas. Problems have arisen, legal aid lawyers said, primarily because crew leaders must work within strict profit margins to recruit and employ the workers. Seed-corn companies, the lawyers said, typically arrange to pay a contractor a lump sum, but reserve the option to require extra work, with no guarantee of compensating the extra time it takes, to complete the work to specification. One Monsanto contractor, for example, had to perform work “in accordance with Company quality standards,” according to a 2012 contract that Midwest obtained from the records of a lawsuit filed by the contractor against Monsanto. Under such contractual terms, Dwyer and Schell said, companies can require contractors to direct their crews to make extra passes in the field — and leave the contractors to cover the cost of paying the crew for the extra work. This might not otherwise cause problems for the workers if the company took full responsibility for the workers, Dwyer said. She pointed out that Pioneer now issues checks to crew members directly, but said that both Monsanto and DuPont Pioneer allow the contractors to log the hours of their crew, which she said is often where the alleged trouble starts. According to Schell and other labor lawyers, the 2007 ruling on the Reyes v. Remington Hybrid Seed Co. case would put the onus on the companies for such alleged violations. But companies generally take the position that independent contractors are responsible for abiding by the law in recruiting and supervising workers. Lord would not elaborate on which circumstances the company would be a co-employer or explain the company's responsibility for recruitment of workers. But if they fail to explicitly acknowledge liability for their contractors, as legal aid attorneys say the companies do, Monsanto and its counterparts face little material consequence. Because Congress has prevented legal aid clinics from filing class-action suits since the mid-1990s, they said, the companies typically pay out only $500 to $2,500 per worker in individual settlements. The Department of Labor doesn't add much regulatory teeth either. Jim Kessler, immigration branch chief for the agency's Wage and Hour Division, and Michael Kravitz, the division's communications director, agreed only to an off-the-record interview for this story. The current labor-contracting system too often results in abusive - and sometimes dangerous - conditions. But according to results of a Freedom of Information Act request, the agency's detasseling-related fines of seed-corn companies run in the tens or hundreds of dollars per worker — and fines for violations in the cornfields in the past decade cost Monsanto only $850. In this relatively permissive judicial and regulatory environment, the potential Reyes v. Remington precedent fails to significantly influence seed-corn companies, said Tom Thornburg, a former attorney with the Michigan-based legal aid clinic Farmworker Legal Services. “You show Monsanto on paper that they have an obligation [under Reyes] that they need to know what their contractors do and police them – that they're liable – and they will simply settle,” said Thornburg. By maintaining distance from the behavior of their contractors, and by effectively capping the fees they pay the contractors, the companies invite behavior that spurs consistent complaints each year, said Schell, Thornburg and other attorneys. Many wage problems, according to the Center's review of the complaints, start at the places of recruitment in south Texas where contractors allegedly violate farmworker law requiring full disclosure of work terms. In anticipating tight margins and the companies' strict specifications, contractors often recruit workers by a practice of “bait and switch,” said Bill Beardall, a University of Texas at Austin law professor and migrant labor advocate who helped draft the 1983 federal Agricultural Worker Protection Act. As a result, according to Beardall, Schell and other labor lawyers, the companies sometimes end up paying settlements on their use of contractors. But by arranging to pay contractors a lump-sum amount, usually per acre, the lawyers said, Monsanto and DuPont Pioneer keep annual wage expenses and liabilities low and predictable — boons in a highly volatile, weather-sensitive industry. Hybrid corn has been commercially available since before the 1930s and not all hybrid corn is genetically modified. Since the late 1990s, genetically modified technology has transformed the field, in which now GMO corn seeds account for more than 90 percent of acreage in the U.S. and about $11 billion in annual sales, according to the National Corn Growers Association. The association does not keep track of the number of farm labor contractors used in seed-corn production – or on the numbers of workers involved. But according to Martin, the agricultural labor specialist, GMO hybrid corn attracts scores of contractors and thousands of migrant workers to the fields each growing season. In recent years, seed-corn companies have increasingly begun shifting to H-2A foreign guest workers, who are recruited legally within other countries, including Mexico and its Central American neighbors to the south. They receive higher-than-minimum-wage pay, but do not have the same protection under the Agricultural Worker Protection Act. But for now, according to Keberlein Gutiérrez, the Illinois-based lawyer with the legal aid clinic LAF, much seed-corn production still depends on migrant workers recruited from bus stations, parks, and other sites in the Rio Grande Valley. The use of contractors doesn't always go badly. Sometimes wage-related paperwork is maintained, housing is adequate, workers are paid their due, and seed-corn companies hire scrupulous contractors who keep promises. Indeed, Schell and others point out work in other crops nationwide generally involves even worse labor conditions than corn. For one thing, Schell and Martin said, pay in GMO corn looks generous compared to other crops. With the higher pay, detasseling jobs are more likely to be filled by documented workers, who have more protection under relevant federal laws and access to legal aid clinics. The greater access of documented workers, Schell and Martin said, partly explains why work in seed corn has left a relatively full record of allegations. Compared to smaller seed-corn companies, Monsanto and DuPont Pioneer also hire the most workers, said Keberlein Gutiérrez — and those workers have greater access to legal aid. “The bigger operations run more work sites and labor camps [where] it is often easier for us to do outreach [and] get information on when workers are around,” he said. By contrast, legal aid offices have fielded relatively few complaints against smaller companies. But legal aid attorneys said the smaller companies use contractors in similar ways, with similar results. Monsanto provides guidance, training and some support to its work crews. To facilitate fair treatment of workers, Monsanto issues each contractor a one-page set of guidelines that clarify “expectations Monsanto holds for all Farm Labor Contractors” on issues ranging from pay to violent threats. Lord would not comment on how the company enforces the document or how it selects labor contractors – including the extent to which the company uses background checks. But company, court and federal documents show that the Monsanto hired three contractors – Cortes, Abel Cuello, Jr., and Hermilo Cantu, Jr. – after they had previously triggered labor-related complaints, including litigation. Cortes did not respond to multiple letters to a known address or calls to his last known phone number. Cuello and Cantu could not be reached for comment either, despite multiple letters and calls to multiple addresses and phone numbers, obtained through multiple sources. Pat Geneser, Monsanto Migrant Seasonal Labor Manager, did not respond to the Midwest Center's requests to reach these detasseling contractors or any others used by the company. Monsanto senior counsel Mary Tonkin retired in September. Her replacement, Jennifer Scheessele, was copied on the last two rounds of written questions to Lord, the Monsanto spokeswoman. Neither party responded to the questions, which included an inquiry about the reported re-hiring of Eleuterio Cortes. But Taylor, the Iowa Legal Aid lawyer, said Cortes was indeed re-hired at Boone, Iowa, in 2016. For the 2017 season, Taylor said, it was too early to tell whether Cortes would be once again contracting in Boone, Iowa, but she said that earlier in 2017 he reportedly had been working for Monsanto in a different capacity in Huxley, Iowa — a report that Lord would not corroborate. This article was reported with support from the Fund for Investigative Journalism and the Midwest Center for Investigative Reporting, in partnership with The Investigative Fund at The Nation Institute, with support from the H.D. Lloyd Fund for Investigative Journalism. Research assistance provided by Lauren Grandestaff, Ginger Hervey, Renee Hickman, Samantha Sunne, and Francisco Vara-Orta. Laird Townsend is an award-winning editor and freelance reporter whose work appears in national newspapers and magazines.